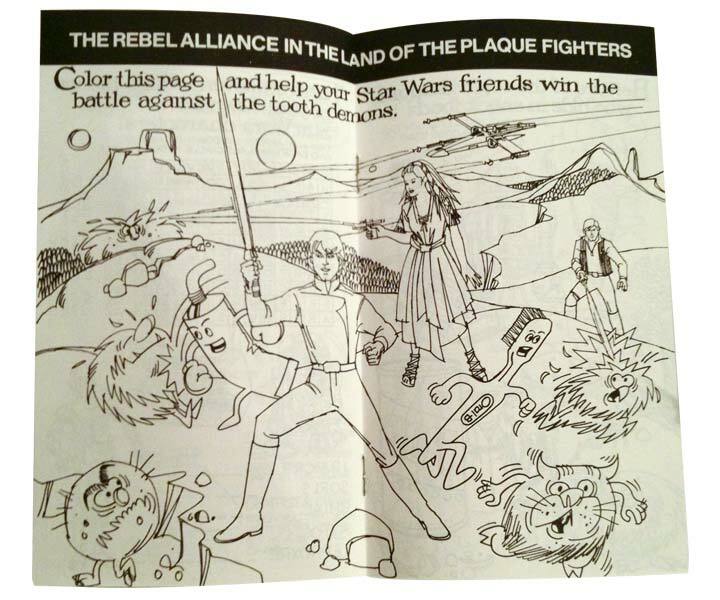 The dentist office – long feared by children of all ages, that is until Luke Skywalker and his band of rebels stepped in to help in the Land of the Plaque Fighters! 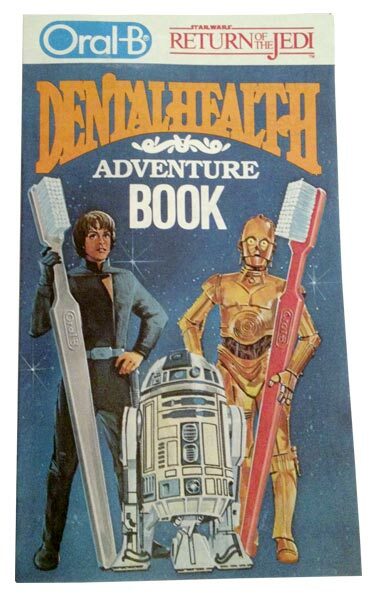 Ok, so maybe not quite that dramatic, but the dentist office is a logical place to market toothbrushes to and Oral-B was no slouch here either. 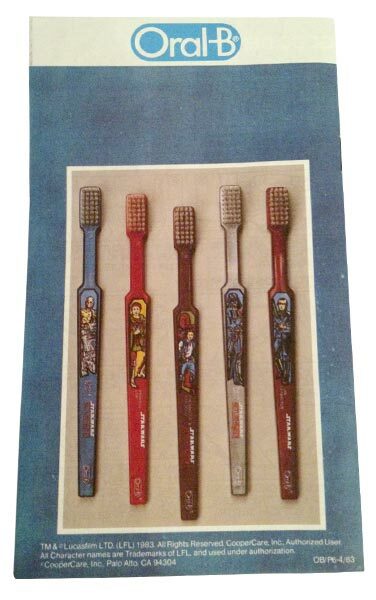 This is definitely Oral-B at their most creative. 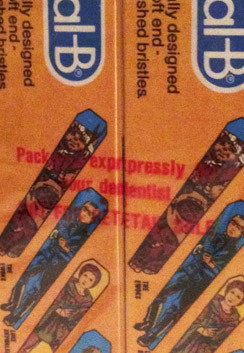 Unique only for the “Packaged expressly for your dentist – NOT FOR RETAIL SALE” text printed in red on the cellophane wrapper. 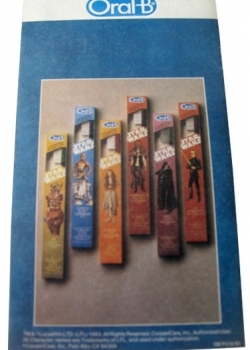 This packaging variation for the Oral-B toothbrushes was intended to be handed out at your local dentist office after your check up. 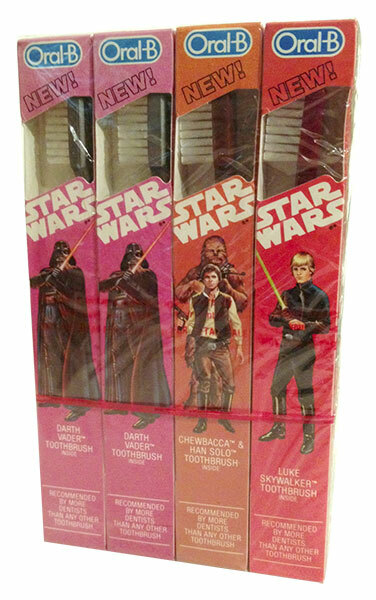 There is a “dentist office” version for each of the 6 toothbrushes. 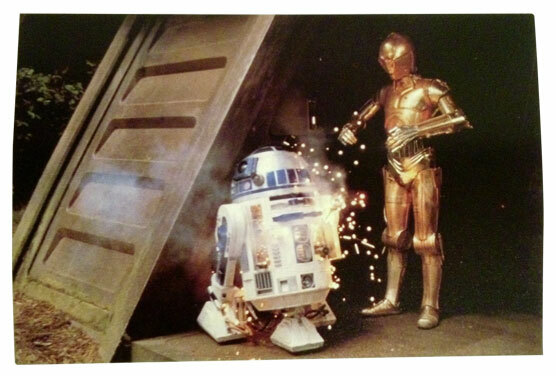 You can even find them in unused “cases” of 12. 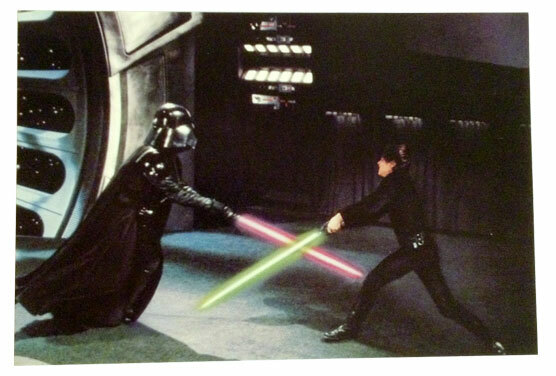 While they are a different type of packaging and would seem to be somewhat exclusive, they really don’t command any more money on the secondary market. 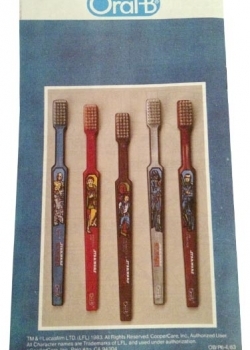 Another interesting set of items exclusive to dentist offices is the Dental Health Kit. 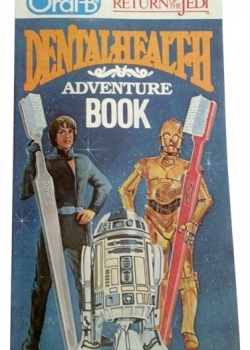 The kit consists of six appointment reminder postcards, one “Star Wars Plaque Fighter” membership card and one “Dental Health Adventure Book”. 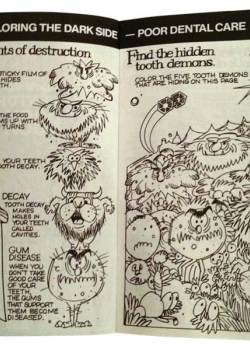 Dental Health Adventure Book – The Adventure Book is a really fun item – it is packed with unique artwork, games, puzzles and information on dental health, all presented in a black and white format that just begs to be colored on (in or outside the lines). 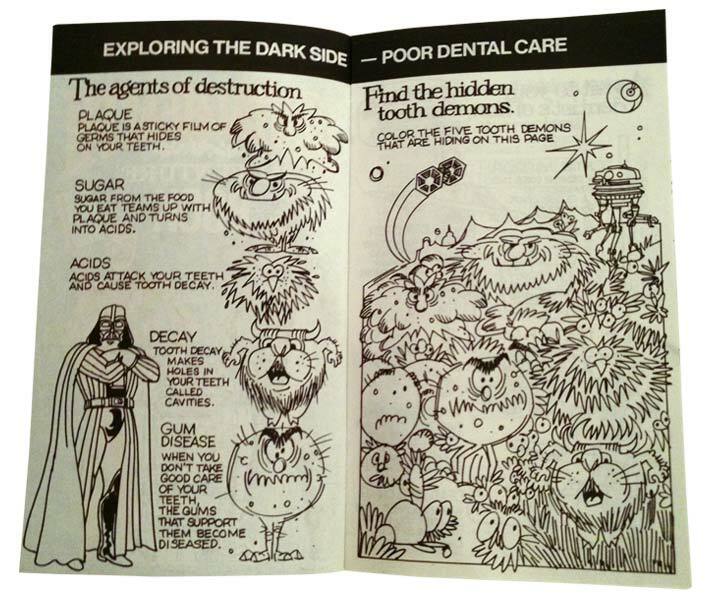 There are a couple of variations of the Dental Health Adventure Book. 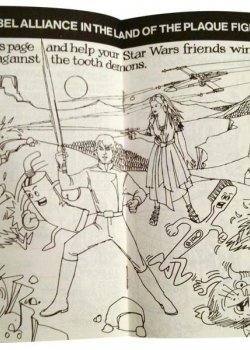 The back cover can be found with either an image of the full set of toothbrushes packaged in their retail boxes, or with five of the loose toothbrushes, all but the Ewoks brush is shown. 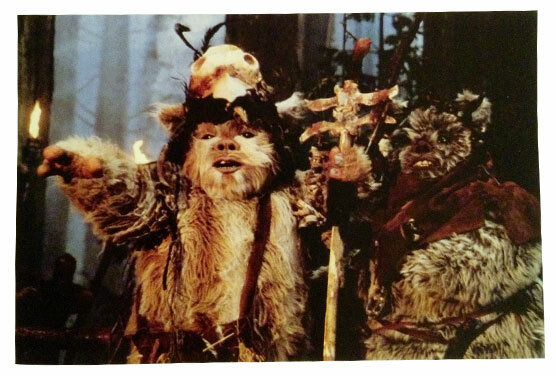 I assume the reason for not showing the Ewoks brush was Lucasfilm was still trying to keep the Ewoks identity under wraps. 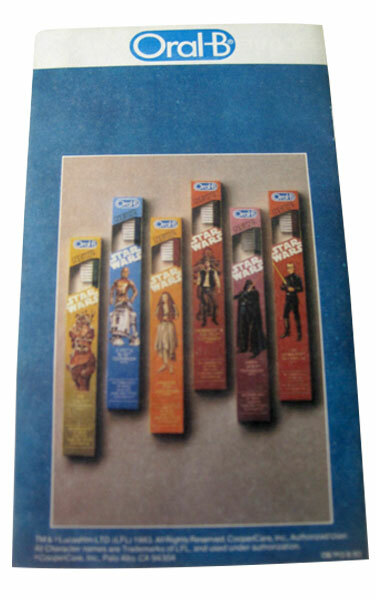 Another variation that I just recently discovered features a perforated set of coupons attached to the back cover. 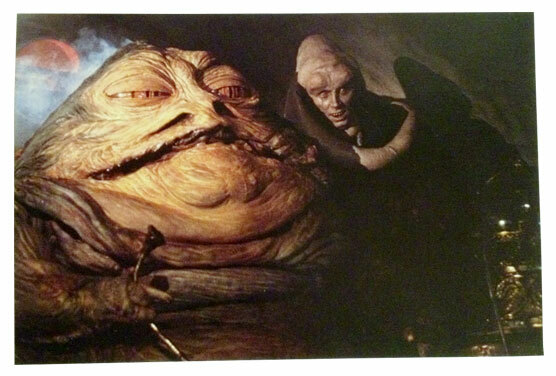 There are three coupons for $.25 off any Oral-B item. At first I thought this was just a matter of all the booklets having had the coupons torn out. 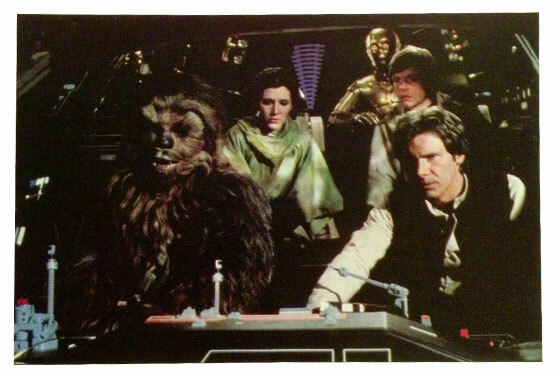 However after closer inspection it’s clear the back cover is not as wide as the other booklets, to compensate for the coupon fold. 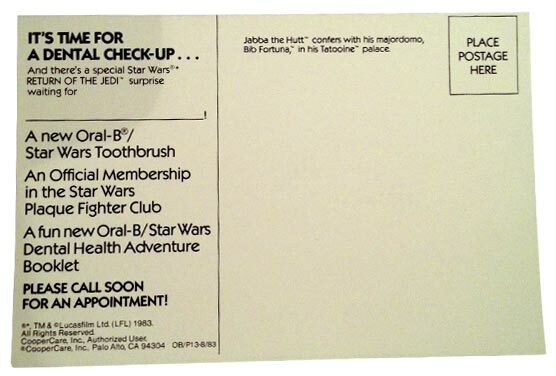 Plaque Fighter Membership Cards – These cards served as a take home appointment reminder. 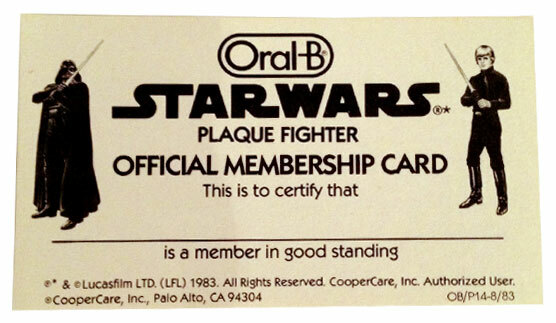 This just had the added benefit of rewarding you for completing your dental exam and becoming a fearsome Plaque Fighter! 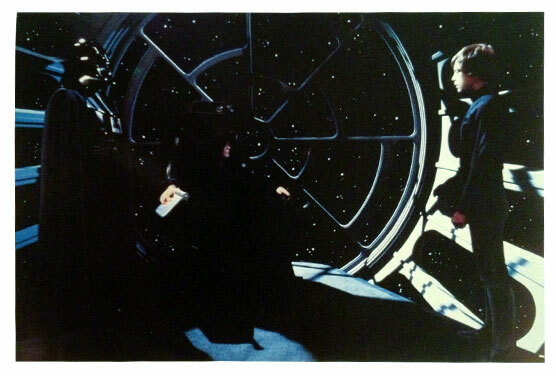 Appointment Reminder Cards – The appointment reminder postcards feature six different scenes from the Return of the Jedi movie on the front, and appointment information on the back. 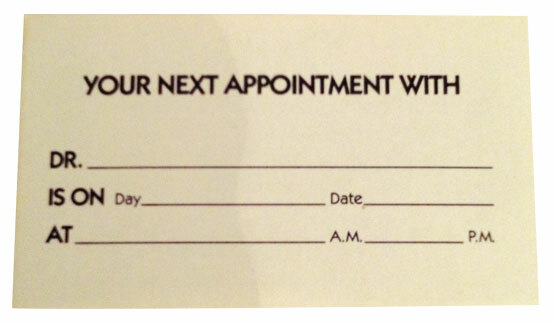 In the days before cellphone reminders, these served to give you a heads up that your next check up was right around the corner. Dentist Office Appointment Motivation Plan – Features info on the Dental Health Kit, reminder cards and the toothbrushes themselves.